The Deccan Development Society (DDS) is a two-decade old grassroots organisation working in about 75 villages with women’s Sanghams (voluntary village level associations of the poor) in Medak District of Andhra Pradesh. The 5000 women members of the Society represent the poorest of the poor in their village communities. Most of them are dalits, (previously known as untouchables), the lowest group in the Indian social hierarchy. The Society has a vision of consolidating these village groups into vibrant organs of primary local governance and federates them into a strong pressure lobby for women, the poor and dalits. A host of continuing dialogues, debates, educational and other activities with the people, facilitated by the Society, try to translate this vision into a reality. The programmes initiated by the Society have evolved over the years into a strong political for rural women. What started off with the intention of ensuring the simple sustenance needs of the sangham members has become a tool of empowerment for them to address the larger issues of food security, natural resource enhancement, education, and health needs of the region. The conscious integration of various activities the Society has helped to retrieve women’s natural leadership positions in their communities, and to fight the lack of access and control over their own resources. These activities, alongside ensuring earthcare, are also resulting in human care by giving the women a newfound dignity and profile in their village communities. This is done in many different ways that all complement each other: food sovereignty includes community gene banks (seeds), control over natural resources, control over market, a special ‘green education system’ that encompasses a range of activities, starting with balwadies [community managed pre schools], which provide a creative learning environment for young children to Pachasaale, a unique school for working children, which takes formal learning and life skills under one umbrella, and transforms education into an area of relevance for rural children. Within this range are fitted other educational efforts like intensive workshops for adult women, and village night schools for out-of-school children etc. During a recent meeting in Périgueux, I had the chance to interview Mayuri, a very special young girl who has already made award-winning videos at the age of 11. 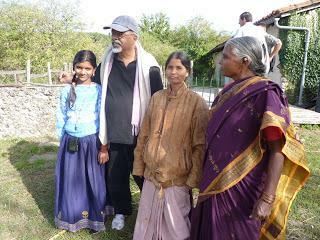 She had travelled there with Sateesh, the General Secretary of Deccan Development Society, and her aunt. Her film on food sovereignty and community seed saving is quite spectacular. She is a prime example of how this amazing educational system can foster and empower natural talent, using media as a powerful communication tool to educate the illiterate (and indeed the literate in Western societies too!). Intrigued by her skills, I interviewed her with Sateesh’s help, so that I could share her story with the readers of our Newsletter. I asked Mayuri where she sees herself in 5 years time. “I hope I shall be making more films on agriculture and rural life so everyone can learn about agriculture. Journalists aren’t doing it. It is my duty, because everyone should know about agriculture. We need to show others how the “government” (this is the term used for any important structure outside the community, in this case, the seed companies) give farmers seeds that are different from our seeds (GMOs). We want to show that with our traditional seeds we can really feed everyone, and have a healthy life”. What sort of things do you normally do at home, apart from making films? “When my grandmother and mother go to cut fodder in the fields, I help them to bring it home. I like to play in the field, to plant the vegetables and to water them”. “I used to feel that I would never be able to do this. Even now, I sometimes wonder if it was me who made the film. I worry with every new film I make if I will be able to do it”. The words of a true artist, who will go along long way in the future. And the proof that the media are a very powerful tool to educate the illiterate on sustainable agroecological practice, one of the key levers to achieving lasting food sovereignty. Questions posed by the workshop: How do the needs expressed by new, cross-cutting social actors generate significant change in public policy and the way in which it is promoted and managed? What kind of relationship can help communities and institutions move towards new forms of implementation of real democracy? A widely shared analysis: Europe is living through a dramatic period, a real “state of emergency”. Democracy has lost its meaning. We are standing by helplessly as decisions are taken at national and supranational level? The “constitutional process” is forced upon us top-down by governments and the European Central Bank; they in turn are under the thumb of the dictatorship of the financial markets. 10 years after the first European Social Forum (ESF), Florence 10+10 brought together activists from many different horizons: students, workers whose jobs are insecure, trade-unionists, environmentalists, “NO-TAV” who are against the high speed train under the Alps, women and migrants. The idea of coming together was to develop strategies and converge around a joint road-map. Because we need to act now, and create the conditions for a social answer and Pan-European citizens’ mobilisation. Democracy, shared heritage, environment, social justice, the struggle against austerity policies and the neo-liberal agenda. European water, Commons that belong to society. Europe of the people supporting solidarity economy, food sovereignty, and defence of areas that are being threatened by useless outsized infrastructure! Economists from 10 different countries launched a European network of progressive economists. The coalition that brings together 80 trade unions and movements throughout Europe launched an AlterSummit (to be held in Athens in June 2013), and many new networks have started working at European level on public debt and the financialisation of nature. Jason Nardi, member of Solidarius Italia, a non-profit-making solidarity economy micro-enterprise1, and member of RIPESS Europe. What mobilisation do we need to achieve real democracy? We have learnt from experience that real power is won through problem-solving actions. Based on our experience of around 50 different initiatives, a local pact was defined in 2001 as a long-term process, grounded in a functional space that provides solutions that are adapted to the specifics of local society, particularly those of a cultural nature. It is an inclusive approach and results in a contractual commitment. It clearly states the values, builds dialogue between categories of actors, teaches them to work in a different way, and produces collective intelligence. Local Pacts, irrespective of what they are called, exist all over the world. But this way of thinking and doing things is far from the norm. A “Pactes Locaux” (1998) delegation was present at the first ESF. Since 2007, the concept of local pacts has progressively developed in terms of their fundamental concepts, and the association has developed at European level. They designed a “Learning Journey” approach, and organised 6 meetings to prepare for the European meeting of RIPESS “Lux’09” in April 2009. Field visits enables people to learn from one another and gain a better understanding of how the local/global dimensions interact. Discussing and reflecting on issues in a non-academic group of practitioners helps achieve consensus to jointly put forward propositions. Activities based on the observation of peoples’ small needs: producers’ markets, exchange of experience and training between “gasisti”, the members of the Solidarity Purchasing Groups (GAS in Italian), planned sharing are some of the achievements of REES – the Italian locally-based Network for Ethical and Solidarity Markets. Local Authorities are involved in the projects that become a source of training for all involved, and a way of remaining in touch with what is happening at territorial level. It leads to growth of local social fabric, both as a driver for promoting the activities and as a structured way of controlling the implementation of public policy choices. It also implies that the concept of citizenship is restored from the downgraded status of mere consumers. By participating in these projects, people win back their right to choose, take control of their lives and re-emancipate themselves. Activities aim to contribute to people’s well-being, as well as being attractive and easy to disseminate. They also shift away from the concept of individual profit-making that is dominated by personal choice to a community-based approach that promotes relationships based on a people-centred economy. There are other networks and territorial districts of solidarity economy in Tuscany, Lombardy, Latium, Trentin and Emila-Romania, as well as Abruzzi and Frijol. They are defined as “An economy of network and horizontal, non-hierarchical relationships between operators, based on the sharing of knowledge, markets, information and resources”3. The strategy of the local pacts is deeply coherent with what Solidarius is concretely trying to achieve through its work. Our mission is to accompany – with training, tools that help social analysis and planning – to build and strengthen cooperation and solidarity economy networks in certain regions? Thanks to the methodology and research-action that is carried out on the basis of an analysis of local realities, needs, resources and the issues and their specific characteristics, we are helping to build local social coalitions that contribute to the dynamic of and support the building of solidarity networks that involve different actors (solidarity enterprises, groups, associations for social promotion and volunteering, “virtuous” institutions…). In reality, it is another way of defining local pacts. As pacts, social coalitions can not be predefined, but are built according to the “glocal” logic, with an ear to the ground and together, a far cry from localism or fragmentation. As pacts, the need to enlarge their activities to encompass a force-field of shared values and objectives that are implicit to solidarity economy, whilst also avoiding being self-centred or catering only to minority interests. The town council approved this project on the 27th October 2006. It includes building a permanent round table, provides a building in Mestre as well as a budget for promoting and developing the concept. In 2010, the Sesterzo cooperative was constituted to reach the objectives? AERES, who are partners of the town council, propose certain activities and initiatives under the umbrella of PLIP, a network of microstructures committed to alternative economy. The objective is for Palaplip to become a meeting place for the movement. It includes an educational centre for both young people and adults, an experimental incubator for businesses and professionals, a local cultural centre as well as a place that can bring together different groups involved in solidarity and local economy. Two illustrations of this are “Strada Facendo”, a street theatre school aimed at young adults. It encourages civic participation and promotes a strong feeling of community among participants. The first season of the programme ended on May 6th 2012, with “Poetic Mob” held in Ferretto Square in Mestre, a show put on by students whose ages ranged fro 8 to 14. The street art and theatre enabled these students to experiment with a new of relating to the town and its institutions. The “Osteria Bio-Solidale” is another solidarity economy entrepreneurial experience. All aspects of the project have been built taking social and environmental aspects into consideration. Jason Nardi: Let us imagine and build the Europe we want. Let us bring together the live social forces within our communities to create the necessary critical mass and stop the spiral of financial speculation that leads to the death of democracy. This is what we most urgently need to do. Local pacts between communities of citizens who practice solidarity economy in its different forms, together with the virtuous local authorities (or simply “normal ones), and institutions are the way forward to building another bottom-up Europe in a practical, efficient way. Local pacts are a tool for cooperating between actors at many different levels. Democracy is the foundation for territorial management of daily challenges as well as providing a connected, dynamic and different approach to the globalised economy. Cooperation translates shared responsibility in the way of acting – both together and independent – in a global, coherent approach that aims to meet an objective of general interest. Citizens’ power of initiative and action includes saying no to exogenous planning decisions that compromise the possibility of the local people that they affect to live in health, in security and in peace. Franca Bruglia: This meeting has been full of ideas. All the means we have are changing. Participating in building a common good reaches beyond the abstract concept of democracy, and is linked to local territory through concrete actions that involve all the stakeholders in genuine collaboration and equality. David Marchiori: The most important thing is to meet the objectives with networks based on new relationships, and build on the “Altraeconomia” alternative economy system. It is first and foremost a space where people can meet and share their convictions that it is possible to achieve social development by using open networks that do not compete with each other.